So by now I’m sure most people have heard the news that Carl Crawford has been signed by the Boston Red Sox to a 7 year $142 million dollar deal. Many Yankees fans were upset by this news. But in all honesty, I really didn’t care. I’m the only one in my family of Yankees fans who didn’t want Carl Crawford. Let me put it this way: if the Yankees signed him, that would be okay. I wouldn’t be jumping for joy or anything, but I wouldn’t be upset. And if they didn’t sign him, I would be okay. I preferred not having him over having him, but either way would have been fine. Don’t get me wrong: I’m not just in denial because the Yankees failed to get him. I did a whole debate about how I felt they shouldn’t sign him. And I won. 1) If the Yankees really wanted him, they would have pursued him more actively and wouldn’t have backed down. 2) He’s seems like a troublemaker. I don’t know. I heard a bunch of stuff about him complaining about his spot in the lineup and how he doesn’t want to play centerfield. I didn’t want my Yanks to have to deal with that. 3) Somebody would have been the odd man out. Carl Crawford would push aside either Brett Gardner or Nick Swisher. I heard rumors that the Yankees would try and trade Swisher if they got Crawford, and I think I’d die if that happened. So whatever – who needs Crawford. 4) He looks like a gangsta. That tattoo on his neck is repulsive. I didn’t want to have to stare at that every time it was his turn to bat. I know some Yankees have tattoos, like CC Sabathia and A.J. Burnett, but on the arms it’s okay. Even the shoulders. That’s fine – they can always be covered up. But the NECK? Eew…just, eew. Carl Crawford just doesn’t look like he belongs in pinstripes. And I’m glad he’s not. But am I okay with his destination being BOSTON? I expected the Red Sox to get Jayson Werth. And since that plan failed, I knew they would go after Crawford. I expected him to be a Red Sock, so I’m not that upset. We’ve dealt with Crawford for this long anyway. I’m sure the Yankee pitchers can figure out a way to get him out. And another thing that bothers me: why is it, now that the Yankees didn’t get Crawford and the Red Sox did, that everyone is saying how “Carl Crawford is the BEST all-around player in baseball” ? Whaaaat? I’m sure if the Yankees signed him, no one would say that. One thing I’m excited about, is that the AL East will be back to the way it should be: Yankees and Red Sox. I don’t think the Rays are going to contend again. They’ve let too many of their starts go: Crawford, Pena, Soriano, Bartlett, etc. Too bad. It’s actually quite sad. They just don’t have enough fans, and not enough revenue to keep their players. They had to GIVE AWAY 20,000 free tickets to fill the stands, and they only drew 30,000 that day. Pathetic. So the Red Sox look pretty good on paper already with the additions of Adrian Gonzalez and Carl Crawford. If the Yankees get Cliff Lee, it won’t matter how much offense the Red Sox have, or how much offense the Yankees have. I’m just hoping Cliff Lee DOES sign with the Yankees….I’m not feeling too good about this anymore. Why is it taking him so long? Silver and Gold…and Cliff Lee! Oh, Sam the Snowman…and my favorite Christmas movie. Since baseball is over, I guess it’s okay to start looking forward to the Holidays. I don’t really know what I want for Christmas this year. The offseason has been relatively interesting so far. MLB Network’s “Hot Stove” has been filled with news about the Gold Glovers, the Silver Sluggers, and of course, Cliff Lee. I’d like to congratulate the three Yankees who won awards so far this year. Congrats to Derek Jeter, Mark Teixeira, and Robinson Cano on receiving Gold Gloves at short, first, and second! A-Rod should’ve won, too, but I guess that would have seemed unfair. I’m proud to say that my Yankees have the BEST infield in all of baseball. Robbie Cano didn’t stop at the Gold Glove. He ALSO received a Silver Slugger Award! Congrats, Robbie! Put both those beauties on your Christmas Tree this year and make Sam the Snowman proud. -He says he doesn’t like the heat, so he might not want to stay in Texas. -Texas says they might get Victor Martinez as an incentive for Lee to return to them. -Cliff Lee’s stupid wife claims that she hates New York. -Ryan Zimmerman said he’d give Lee some of his salary to bring him to Washington (lol). Jeez this is really stressful. 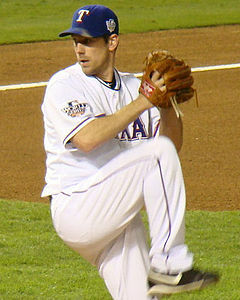 I’ve been a good girl all year long…and all I want for Christmas is Cliff Lee. Oh, Santa, Brian Cashman, is this so hard to accomplish? These rumors are killing me. Cashman, just show him the money. I’m tired of waiting!